The Bodymax Oxbridge HR Air Rowing Machine may not be as good as other air rowers like the Concept2 Model D Indoor Rower, but it certainly is a more affordable option. Even though it falls under the mid-range priced air rowers, it’s still packed with features that are comparable to the high-end models. Bodymax is a trusted brand when it comes to fitness machines, and they offer a wide selection. This air rower, just like the rest of their products, is made of high-quality materials which means it’s reliable and durable. If you’re interested in adding an indoor rower to your home gym, read on as I take a closer look at the Bodymax Oxbridge HR Air Rowing Machine. Bodymax is known to provide fitness machines that are excellent for home use, and they offer them at reasonable price points. The Bodymax Oxbridge HR Air Rowing Machine is their own version of an air rower, and it’s very impressive. It’s stable with a maximum weight capacity of 115kg, and tall people can do full strokes on the equipment. The seat of this air rowing machine is placed on top of an aluminium rail to ensure a smooth workout every time. Air resistance, unlike magnetic resistance, naturally makes rowing harder with your own pacing. The Bodymax Oxbridge HR Air Rowing Machine offers eight levels of smooth resistance to keep you challenged and motivated. It’s suitable mostly for beginners because the highest levels may not feel difficult enough for advanced users. With its wide foot pedals and adjustable straps, your feet are kept in position even when you’re at your most powerful momentum. These will contribute to an effective non-stop exercise as you don’t have to worry about anything else during your session. This equipment also has a built-in heart rate receiver to monitor your heart rate during your workout closely. However, you will need to purchase a chest belt separately. If you want to know whether your workout is effective, you must strictly keep track of your progress. It will help you determine if there’s any improvement or none. Some rowing machines have a tiny monitor that may be hard to read when you’re already in action. Luckily, the Bodymax Oxbridge HR Air Rowing Machine has a large LCD monitor which guarantees an “EZ Read” feature. The large font on display allows you to see your speed, time, calories and heart rate at any angle, no matter how intense your workout gets. The Bodymax Oxbridge HR Air Rowing Machine doesn’t have a heavy flywheel since it’s doesn’t use magnetic resistance, so it’s relatively lighter than other rowing machines weighing only 36kg. However, no one would want to carry something that heavy on a daily basis, especially seniors. That won’t be a problem because the Bodymax Oxbridge HR Air Rowing Machine is foldable, and it has built-in wheels making it effortless to transport to any part of the house. No matter if you have limited storage space, this machine will surely fit into the smallest rooms. 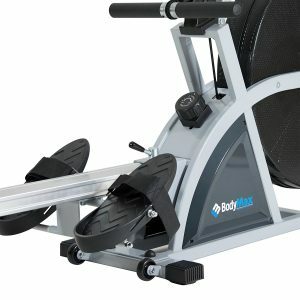 The minor issue that you might encounter with the Bodymax Oxbridge HR Air Rowing Machine, or with any rower, is that they make minimal noise due to air swooshing as you row. But don’t worry because it won’t be a hindrance to your workout, and it isn’t loud enough to be heard by your neighbours. It’s just that these kinds of rowers can’t guarantee a completely quiet operation. 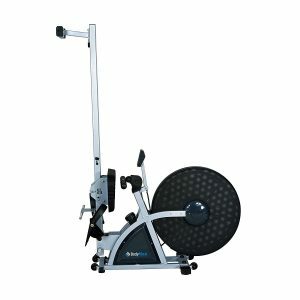 The Bodymax Infiniti R90 Rowing Machine is another fitness equipment from the same brand. 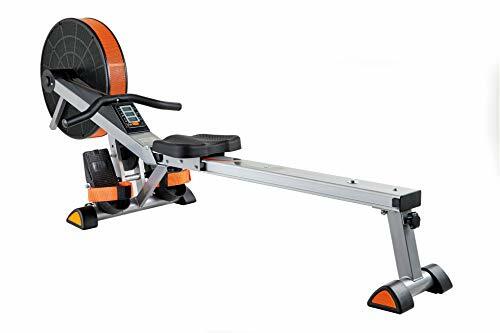 It’s an upper mid-price range magnetic resistance rower, and it’s suitable for any fitness level, from beginners to advanced. This rowing machine allows full strokes even for tall people, which is a common problem faced by those with a height above 6ft. The Bodymax Infiniti R90 Rowing Machine will also keep you inspired to workout with its dual-coloured backlit LCD console. This feature is unusual in rowing machines and some may not even be backlit, but this one displays your information clearly and it 12 programs that will motivate you. It also features closer footrests to create a realistic feeling of rowing on water. 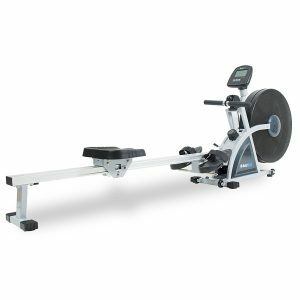 The V-Fit Tornado Air Rower is one of the most affordable air rowers in the market, and it’s highly recommended by the customers. Although it isn’t the best air rowing machine, it definitely gives an unbeatable value for its price. 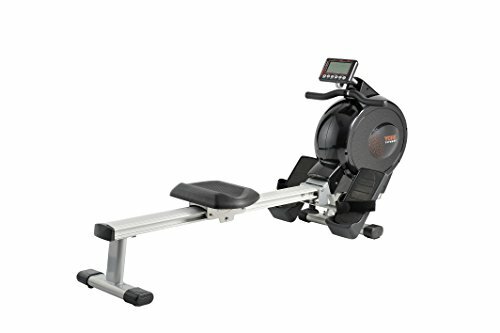 This air rower is made with a robust steel frame, an upgraded sculptured seat, and an ergonomically shaped row handle, which makes working out comfortable so you can do it for a longer period. It doesn’t offer any resistance levels. Instead, it gives a naturally adaptive difficulty level that matches your ability. That means the faster you row, the tougher your exercise becomes. The York Excel 310 Rowing Machine is a budget-friendly option yet offers a wide range of resistance, which is good news for those who would really like to push themselves to the limit. It has 16 levels of magnetic resistance, and take note that the higher levels can be difficult even for advanced users and professional rowers. Tall people will also be able to make the most out of this equipment because it has a 113cm aluminium track that allows full strokes. It’s also stable with a maximum weight capacity of 120kg. 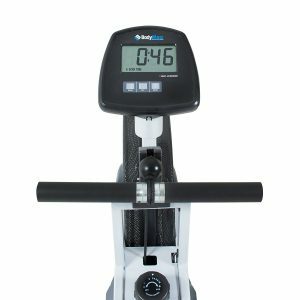 This rowing machine also boasts a 5.75-inch LCD display with 12 pre-set programs that will make you look forward to your next session. 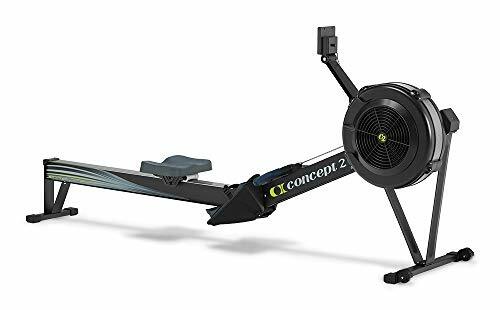 If you have some money left to spare, you should consider investing in the Concept2 Model D Indoor Rower. Despite being pricey, it remains as one of the most sought-after rowing machines in the market. I wouldn’t even argue with anyone that says it’s one of the best, because first off, it can hold users with a weight of up to 227kg, making it almost pass as commercial-grade. 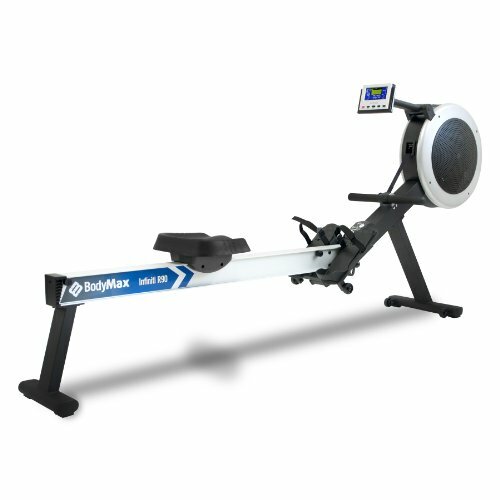 Aside from this, this indoor rower is smartphone friendly, and you can connect it to the free Concept2 app called ErgData to view your progress anywhere, anytime. Since it uses air resistance, the Concept2 Model D Indoor Rower responds to your effort on every stroke, giving you full control of your resistance at all times. In my humble opinion, the Bodymax Oxbridge HR Air Rowing Machine is worthy to be a part of any home gym. It’s an air rower so you can’t expect it to be totally silent, but it will definitely provide a smooth and efficient workout. It will give you a total body workout making it a great tool for weight loss, muscle strengthening, and boost endurance. Plus, it’s also energy efficient because it completely works without the need for electricity.